Talking Showgirls with David Schmader. Last Thursday, in the hallowed halls of the Belcourt Theatre, David Schamder held court with an epic screening of Paul Verhoeven's 1995 film Showgirls. It was a transformative experience, and all who attended left theatre as different people than they arrived as. I had the chance to talk to Schmader a week before, to hype up the event, and we teased a couple of different pieces out of it. There were some online bits that couldn't fit the print edition, then the print edit itself. Well, in commemoration of the event, my fearless editor and I have placed the entire* piece online, and it's yours to read and enjoy. So please do enjoy it. * - Entire, that is, minus the epic mini-discussion we had about Rena Riffel's Showgirls 2: penny's From heaven, which I hope to let loose on the world at a later date for a screening of that film. At the movies: The Lone Ranger. Well, it's not often that one day after a review I write is published that a consensus between the exhibition industry, 'conventional wisdom,' and angry kids at the mall develops that casts aside not only a film I dig, but several points that I specifically tried to emphasize. It's sad, because it's now apparent that this is going to be 2013's John Carter of Mars- that is, an interesting, overlong phantasmagoria that will get used as a bludgeon (see also the piece I wrote about Heaven's Gate last month). Anyway, give me a read if you like, and see the film- it's so much better than any of the Pirates of the Caribbean movies. 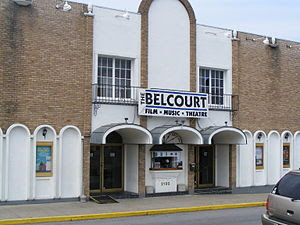 So I got to talk about the expansion of the Belcourt's Midnight Movie series this week. I think I come off- dare I say it- respectable.